I love the Night School series so much. 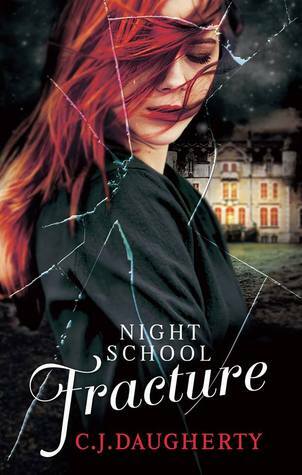 It really is my favourite recent series and I really loved Fracture, the third book in the Night School series. In this, Allie is grieving and angry over the events of the previous book, she's trying to work out who she can trust and she's a bit frustrated with the lack of options when it comes to working out who the traitor in the midst and how to proceed after the loss of her friend. I do love a girl with anger issues and that is exactly who Allie is at the start of Fracture. Thankfully, over time she is able to see that she wasn't the only person affected by Jo's death and everyone at the Academy and within Night School is working towards the same goals. Throughout, I've loved Allie for her humour and wit, her big heart, her braveness and her strength and determination. The other students at Cimmeria are also wonderful, I loved the ongoing friendships between Allie and Rachel and Zoe. Lucinda and Isabelle are both fascinating characters that bring interesting things to the story. But of course, it is the relationships between Allie and both Carter and Sylvain that makes my heart beat faster. I loved the realisations that Allie makes in this book in terms of her romantic dealings and how she was able to talk through her confusion and make some decisions. I'm sure not everyone will be happy with the outcome, but I definitely am! I love the fast pace of both this novel and the entire series. Everything felt like it was on full-throttle and there's never a dull moment at Cimmeria Academy! While there are many things revealed to Allie and to us the readers about Night School history and their importance globally as well as what part Nathaniel and Isabelle play into Night School, there are still many questions left unanswered... which can feel slightly frustrating as the next book will not be published until next year! Fracture was a wonderful blend of mystery, action, romance and friendship. I'm dying to return to these characters and story, the fabulously creepy boarding school and to see where this series will go next!